Don't choose a lender until you've considered these 13 things. 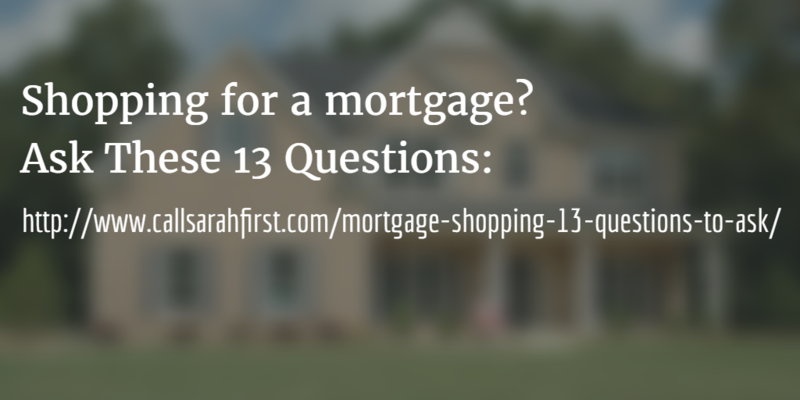 Are you shopping for a mortgage lender? Ask these 13 questions to help you make your decision. REMEMBER-before you meet with the lender, know your own personal goals and history. How much do you want your monthly payments to be? Does that include taxes and insurance? When do you want to move? Do you have a lease you have to work around or house to sell? Do you have problems in your credit history? Pending job changes? How long do you plan to live in the house? Many lenders will ask you questions like this as part of their interview with you to ensure they offer you the right mortgage options. 1) Do you have any special expertise? There are so many loan programs! Conventional, USDA/Rural Development, Federal Housing Administration, Veteran Affairs loan, MN Housing, Renovation or “rehab” loans…look for a loan officer with experience and contacts in that market. If you need a jumbo loan larger than a conventional loan (often half a million dollars or higher, depending on where you live) that’s a special loan too! And remember, the questions from above may factor into the loan you choose. 2) How long have you been in the mortgage business? If the person you were speaking with is relatively new to the industry ask who will be supporting them if there are hiccups in the process. Get the contact information of this person and make sure that they’re accessible. 3) What is the interest rate on this mortgage? Ask for the lender’s loan estimate, which breaks down the interest rate and fees. It will include the annual percentage rate (APR), which accounts for the interest rate, points, fees and other charges you will pay for a mortgage. Discount points reduce the interest rate. They are prepaid interest and are tax-deductible. Origination points are fees charged by the lender to cover the costs of originating the loan. 5) What are the closing costs and pre-paid expenses? Borrowers pay fees at closing for services provided by the lender and other parties, such as title companies. Lenders are required to provide a written estimate of these costs within 3 days of receiving a loan application. 6) When can I lock the interest rate, and what will it cost me to do so? Interest rates might fluctuate between the time you apply for a mortgage and closing. To prevent getting a higher rate, you can lock the rate, and even the points, for a specified period. Fees may apply, but not always. 7) Is there a prepayment penalty on this loan? Is their a grace period on payments? If I have mortgage insurance, can it be removed? If so, when? Some lenders charge a penalty if you prepay on the mortgage. Some apply only when you refinance or reduce the principal balance by more than a certain percentage. Find out the penalty specifics and see if your lender will lower the rate if you choose a loan with a penalty. If you have mortgage insurance on an FHA loan, you are likely stuck with it until you refinance or pay off the loan. On a conventional mortgage, you may be able to have it removed after 2 years. 8) What is the minimum down payment required for this loan? What is the required credit score? A higher credit score and bigger down payment might mean a lower interest rate and better loan terms. With a down payment of less than 20%, you will probably have to get mortgage insurance, increasing your monthly payment. 9) What are the qualifying guidelines for this loan? Ask about requirements relating to your income, employment, assets, liabilities and credit history. Qualifications for first-time homebuyer programs, Veterans Affairs loans and other government-sponsored mortgages are typically less stringent. 10) What documents will I have to provide? Lenders require proof of income and assets. Documents requested will likely include bank statements, tax returns, W-2 statements and recent pay stubs and/or employment verification. More may be needed to show your down payment and ability to pay closing costs. Have these things ready to keep your process moving along smoothly. 11) How long will it take to process my loan application? Depending on how busy the lender is and their companies underwriting process, it can take as little as 3 weeks or as long as 60 days. Be patient and forward any requested documents quickly to speed up the process. 12) What might delay approval of my loan? A job change, an increase or decrease in salary, a new debt, a change in your credit history or change in marital status could delay your loan approval. The best way to avoid that is to put your financial life in a holding pattern until you reach the closing table. 13) Does your company hold loans or sell them after they’re originated? Ask who will be servicing your loan. Who you make payments to after closing? When is the first payment due? REMEMBER- It’s not JUST about fees or rates. It’s about the best lender for your needs. A lender that doesn’t have a smooth process can delay your closing costing you time, headache and possibly fees rearranging your purchase agreement and move. The reputation of the lender may also factor into your offer. Lenders that have a good reputation among the real estate industry help their buyers by giving the offer strong credibility and the listing agent confidence that the closing will happen. Finally, not all lenders offer the same service. Some have follow-up systems that keep you in the loop every few days or weekly while others never call you unless they need something. Ask about their process. Click here to view more buyer tips!